There’s something particularly distracting about cold feet. It goes further than just discomfort – although that pain you get just before you lose feeling is pretty exquisite. Once your feet get cold on a ride, it can become an all consuming distraction that takes your focus off the trail and onto your feet. If you just try and cross your big toes a bit, does that make them feel warmer? Can you wriggle them into improved circulation? Will stamping on the ground as you open and close a gate help generate some warmth? Sadly, all too often, none of this works, and winter rides can be made or broken by your choice of footwear. We’ve had a caterpillar’s worth of winter boots to test, and we’ve been out in all weathers to check them out. Read on for the verdict on this footwear, all described by the manufacturers as ‘winter boots’. Death-ice trails. Perfect testing grounds for winter boots. These boots wouldn’t look amiss at a Death Metal concert, which may or may not earn them style points, depending on your outlook. Designed for temperatures of -3°C to -18°C, they’re aimed at the fat biker market (because frankly, who else would be mad enough to head out in such cold conditions?). 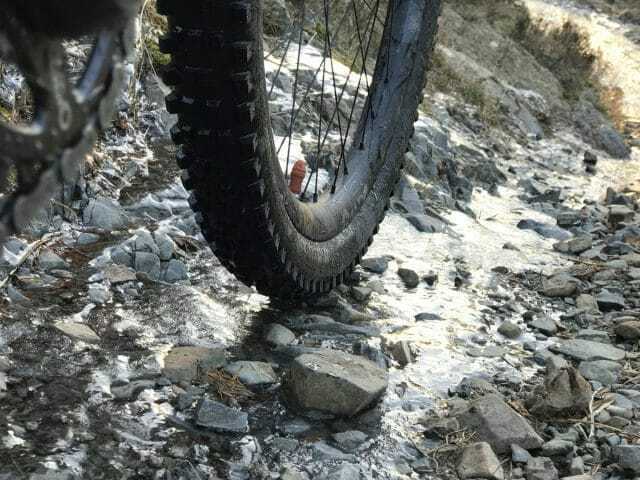 With substantial tread on the bottoms of the boots, you can happily walk around in them without slipping, and they will pair up fairly well with a flat pedal if you’re not needing that glued-to-the-pedals feeling that hammering over rough rocks may well require. For riders who ride clipped in, there’s anchor points for cleats, and it’s sufficiently recessed that I didn’t find it caused me problems when walking. Sizing is a bit tricky – they come up very small, so where I would usually where a 41 in cycling shoes (and a 40 in street shoes) I ended up in a 42 in these, as the 41s had my toes pushing at the ends. This did mean they were rather wide for my narrow feet, but an extra pair of socks is no bad thing inside a winter boot – although this oversizing wouldn’t be too comfortable for a long hike-a-bike. Any fit issues are exacerbated by the weight of the boots, as they’re definitely on the heavy side at 887g each – something that is much less noticeable when you’re teamed up with a fat bike and trundling through the snow. 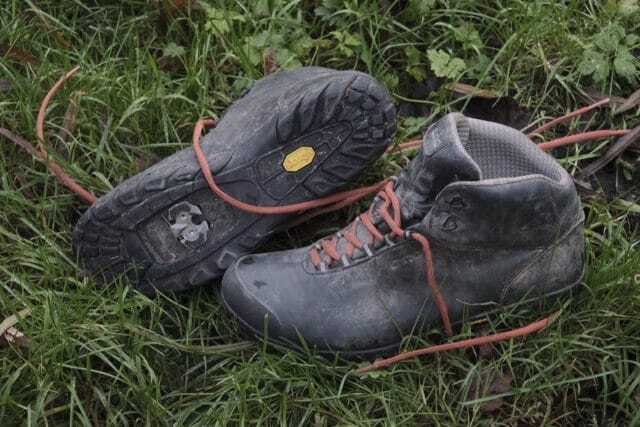 The lacing system with Velcro ankle strap holds the boot firmly in place, though the bulk of the boot and the slippery laces does mean it’s tricky to fine tune the fit around different parts of the foot. 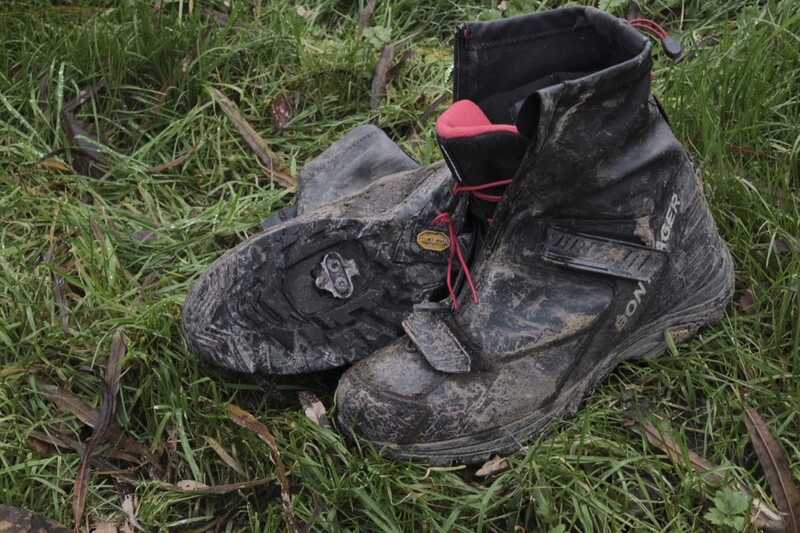 In use, these are exceptionally good at keeping your feet warm and dry. Paired up with decent waterproof trousers, I have even chosen to wear them for off the bike activities, such as tramping round muddy spectator areas at cx races, such is their effectiveness on the keeping-you-warm-and-dry front. Even at low temperatures for big days out in Finland I found that my toes presented no problems and stayed warm, despite plenty of wading through snow for photo opportunities and such like. The waterproofing is brilliant too – a sudden cloudburst back home saw me grab these as the nearest available footwear as I dashed out to unblock drains in an effort to prevent flooding. An hour or more of wading up gutters and clearing drains and I returned with dry – but rather warm – feet. Indeed, these are so warm that they’re too warm unless it is really cold, so you’re probably only going to spend the money on these if riding in proper cold weather is a regular occurrence for you. They’re also very chunky, so using them on my road bike for deep winter commutes resulted in a very strange sensation of not really being able to feel the bike. It’s not what they’re designed for, it feels odd, it looks odder – but my feet stay warm and dry. On a ‘normal’ mountain bike (whatever that standard is these days) they’re also bordering on the clumpy, but if you’re wearing these then you’re probably in deep winter filth where staying warm and dry is a higher priority than your ability to nimbly flick your way through rock gardens. Not so great for: XC nimble riding. Best for: Being warm and dry whatever the weather. If your main concern is staying warm and dry and you don’t mind sacrificing a bit of agility to get that then these could well be the boots for you. Inner booties for your tootsies. OMW? Old Man Winter, of course. These boots come from Trek, whose head office in Wisconsin knows some bitter winter weather and, with that experience behind them, are designed for the worst winter conditions. The OMWs are actually two pairs of boots, one inside the other. The outer boot has an impressively chunky Vibram sole, with SPD fixings in the stiff shank. Though if you run flat pedals, then they’d be equally capable. The outer boot features a lot of scuff guarding in its lower levels, joining seamlessly into a waterproof rubberised gaiter up top. There are a couple of transverse Velcro straps for crude volume adjustment, a loop for further gaiters, and a water resistant zip up the front to snug up the gaiter. Finally, a toggle at the top of the cuff will tighten this gaiter to your shin. The inner boot looks something that a touring car racer might wear. It’s a sleek, Thinsulate-padded fabric boot. There is webbing sewn in to support the lace eyes, but apart from that, it’s a very comfortable, squishy thing with a captive, padded tongue. A pull-tab helps get the thing on. There’s a foil-backed insole for further protection from the cold ground. At a push, they’d make decent Bothy wear and the removability certainly helps with drying them. Around back, there’s a heel-cup made from that one-way velvety material, to avoid heel lifts in the outer boot (though there’s no reciprocal, reverse-velvet inside the boot). Properly tested in proper mud. The only sensible way to put these on is inner first, and then into the outer boot. Despite claims of roominess, I had to size up two sizes to get a comfortable fit with thin socks (I’m a 43 and wore a 45). Once on, though, your feet are constantly reminded of just how warm, dry and cosy they are. 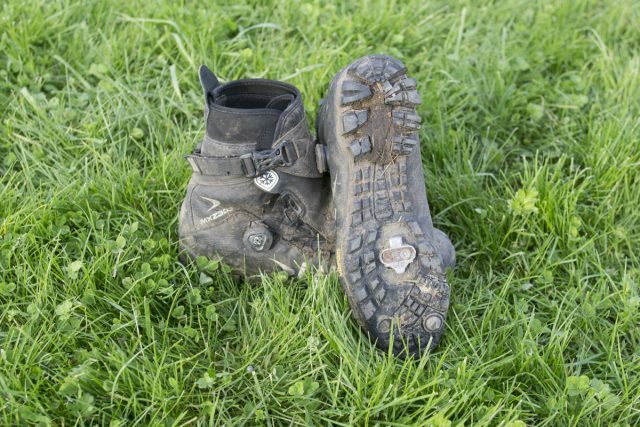 The boots are stiff enough for sustained walking or pedalling. Dialling in a snug, racing fit is hard to do as judging inner boot tightness out of the outer is a vague science, but the kind of riding that these are aimed at – big, long days out with lots of on/off the bike mixed terrain – doesn’t warrant race shoe fit. There’s plenty of room for toe wiggling, with little heel lift on walking. I’ve had no issues with the front zip on this test, but I have used similar shoes where the zips have eventually gummed up with grit and then got stuck or failed, rendering the shoe useless. I imagine the Americans at Trek envisage the cold, clean world of snow-biking, rather than the grit of a typical British winter. To be fair, there isn’t a perfect solution out there that allows both sealing and longevity, but just be gentle with that zip and keep it clean. Not so great for: Putting on in a hurry. Adjusting tension on the fly. Best for: Midwinter fat biking through the snow. Expensive, but genuinely warm and cosy winter boots that could make the difference between raring to ride all winter and going home early with cold toes. Warm and waterproof (for something with a hole in the top) but I do worry about that zip. These boots from Giro, its first, certainly carry that ‘I’m a rock climber from the 1970s’ vibe, but there’s also a bit of a leather-clad street motorbike look to them too. The sleek looks help disguise the fact that that Alpineduros are really more of a mid-height ankle boot than a proper hiker. This means that the ankle movement is pretty unimpeded and the boots have an unrestricted feel around the ankle, though the narrow last can make them feel too snug, even after sizing up one, sometimes two sizes, with racing socks on. The thin looks hide the fact that there’s some decent Thinsulate insulation here, under a pretty featureless upper. Just heel and toe bash guards and the rest is a smooth surface, which makes them a cinch to clean. The sole appears identical to Giro’s Terraduro and this is where I feel it could have done with some chunkier tread. 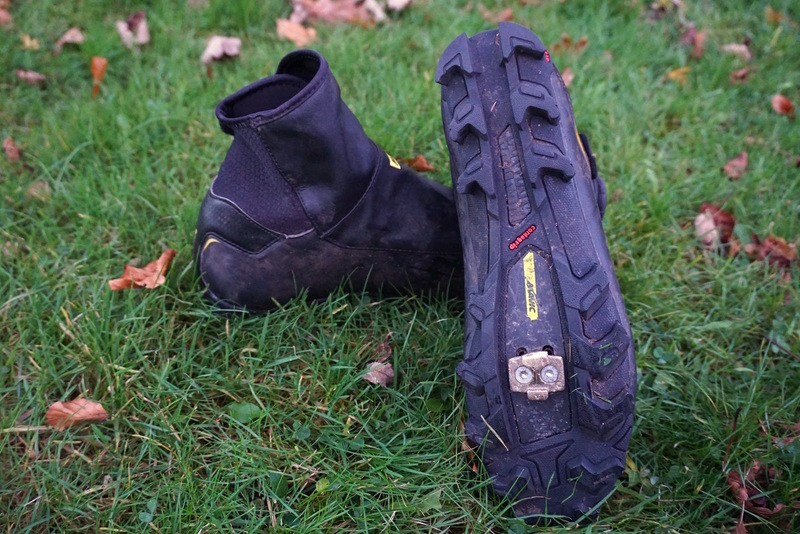 While the Vibram rubber grips well on wet rock, the performance on soft turf and slick mud is way behind something like the Shimano or Bontrager. 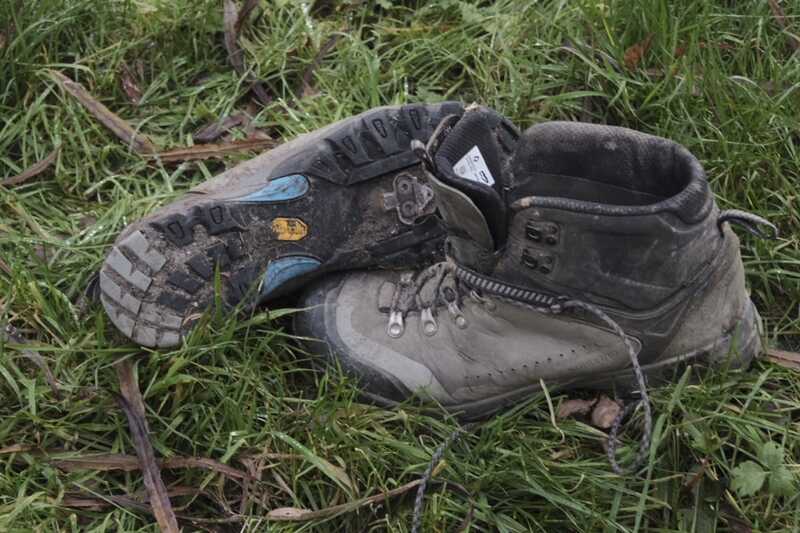 Being pretty thin, the boots do dry well from submersion, though the low heel asks to be filled with spray and scree. There is a set of add-on rubberised scree guards/gaiters if that does bother you though. 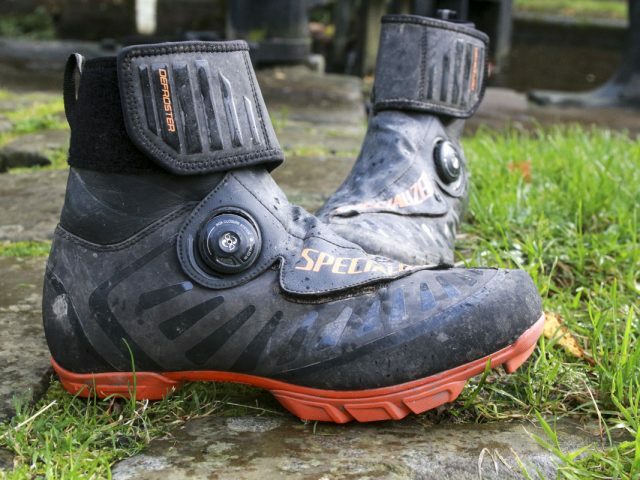 The riding performance of the shoes is great and the amount of insulation is fine for 90% of typical British mountain biking and road commuting. If you need more insulation, there are other brands for you. If you need less, and I do think this style of shoe would be ideal as a rugged summer Desert Boot, then you’re out of luck as Giro is currently only making this one boot. Not so great for: Scree (the low cut design encourages a shoe full). Best for: Three season riding when it’s wet, or cold, or marshy out. A surprisingly slim-fitting, slimline winter boot for all round riding. Laces for the win! Soles are good for tramping and trudging. 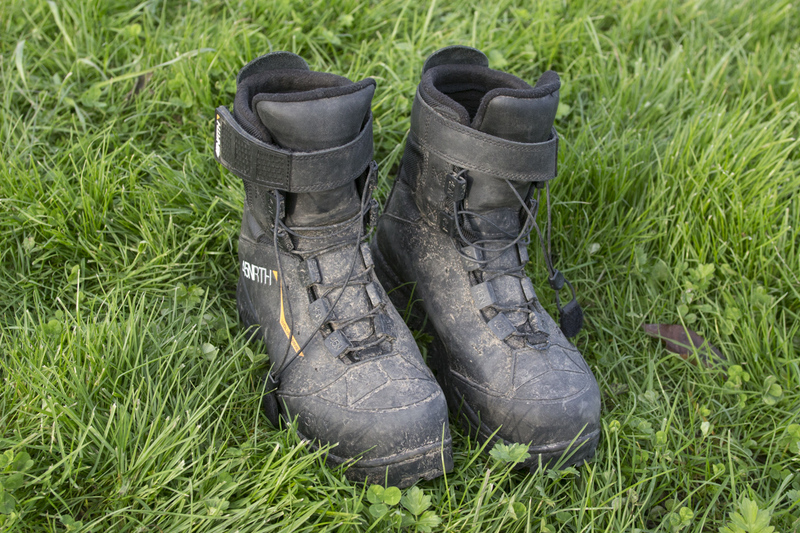 These boots are assembled from a host of promising materials – they have Vibram soles, Thinsulate insulated uppers (made of microfibers which claim to trap and hold body heat, be effective in damp conditions and be thin, lightweight and warm), and Outlast lining (supposed to adapt to thermal changes, absorb excess heat, reduce overheating, chilling and perspiration) wrapped in Pittards leather uppers. They’re also – in my opinion – a nice comfortable shape with supportive cushioning and plenty of toe space. I do have wide feet and these boots feel pleasantly snug – sized up to a 43 from my usual 42. Although the sole is stiff, I have found them nimble enough to comfortably walk, scramble and winter-trudge in them. There is super tread on their soles and also studs (which can be changed for more aggressive ones). Let’s be clear though. There is no such thing as a waterproof boot. Sure, these boots are made of waterproof materials (you can step into a puddle and they won’t leak unless it goes well over the arch), but once water has wicked its way down your legs or trickled (or in some cases swirled) in through the top, in common with all other winter boots it’s not about whether they’ll stop your feet getting wet, but how comfortable your feet are in the (inevitably retained) puddle. 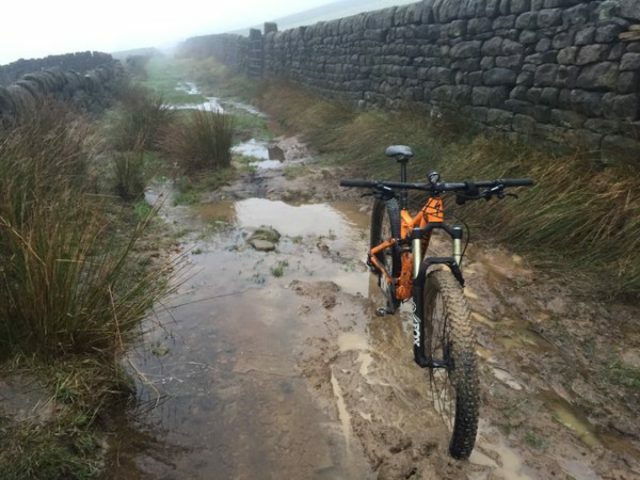 And when this the question, the Lakes pass the first test of UK winter mountain biking, they are warm when wet. I have (so far) not been cold in them although there hasn’t be the opportunity to test them down to their claimed -15. They were also not overwarm on a few muggy wet summer rides – living up to the Outlast lining claims. 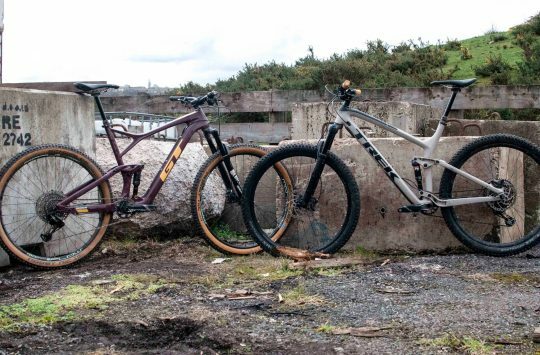 The next question for the British mountain biker is, how long do they take to dry? This is less promising. All that cushioning gets fully soaked and the water has to be removed. Stuff with newspaper for a couple of hours, change soaking newspaper, leave overnight in a warm place (no direct heat – as advised by the instructions). The resulting boot on removal of newspaper is now damp. Another few hours or possibly a day before it will pass as dry. But if you are a daily rider and have to go riding before then, they’re actually fine to put on and their ‘warm when damp’ properties work from the off. Although I like the snug fitting, it does mean that you have to wriggle your feet in which is not particularly speedy. This also means you can displace the lining padding and may need to do a bit of poking/tugging around in the heel area to get it all nice and smooth. The lining in the heel is visible if you peer in and it appears to have survived my general clutziness so far. The fastenings are a combination of BOA tensioner with an ankle strap secured by the same compress-to-open plastic closure you find on Camelbaks and the like. Personally I find BOAs a bit awkward but, to be fair, they have worked so far and are not affected by mud. The absence of velcro or lace fastenings mean fewer essential parts to be clogged with mud (there is Velcro allowing for adjustment of the ankle straps to ensure a close fit but once done you don’t need to undo it). Thorough caking is different – I once had to wash the little plastic fastening on the ankle straps to get enough grit out of it to get it open – but they clean up fine. They also seem to be surviving the constant soakings without signs of wear. One of the drawbacks of these boots are that they are heavy when wet – and at this time of year that’s pretty much inevitable. Overall though, I appreciate warm feet, even warm moist feet. Best for: Clag. Slop. Missle. Dreich. Unremitting drizzle. Low cloud. Storm Brian. 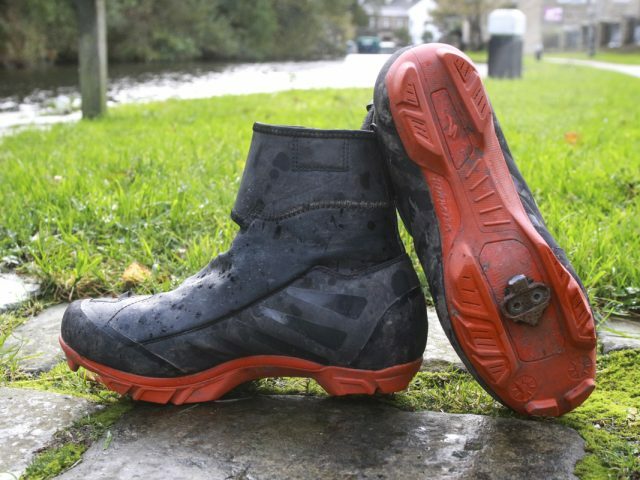 If you are stupid/addicted enough to have to mountain bike when the ground and skies are sodden and/or frozen these boots will have your feet. Trying my size 44 Mavic boots on for the first time, I was struck by the quality feel to the materials used. The black colourway with yellow detailing just looks classy while the use of Gore Tex as the waterproof layer reflects their high end pretensions. To my eyes, they look like a pair of race shoes which have been repurposed for winter riding. I have a fairly narrow foot which given the narrow appearance of the sole meant that my foot felt snug but not unduly constricted. Fastening is taken care of by a single dial retention system with the dial located just below the ankle bone. 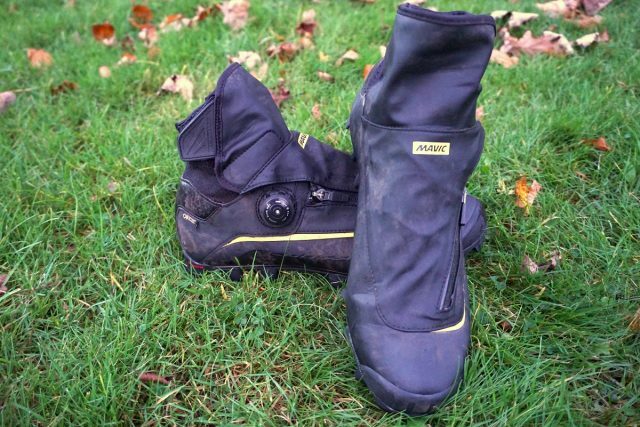 To help keep water out, a neoprene and Velcro cuff wraps round the ankle while a water resistant zip works to reduce the ingress of dirt and filth into the inner boot. The cuff did a decent job of keeping my feet reasonably warm and dry, even during extended periods of rain. Despite my misgivings of such designs, the water resistant zip is still working and didn’t jam up once during the test period. 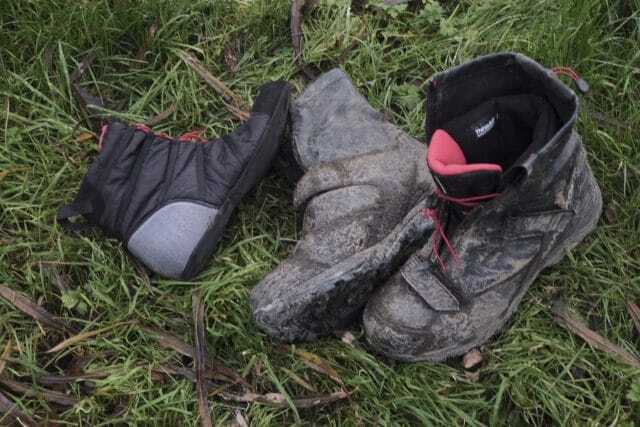 However, the Gore Tex liner stops below the ankle meaning that if you pop your foot in a bog or a stream that is deeper than 3.5 inches then you have just bought a one way ticket to Soggyfootville, population you. This isn’t unique to Mavic winter boots – there are a lot of winter boots on the market that have the same issue. Grippy, but not on wet rock. 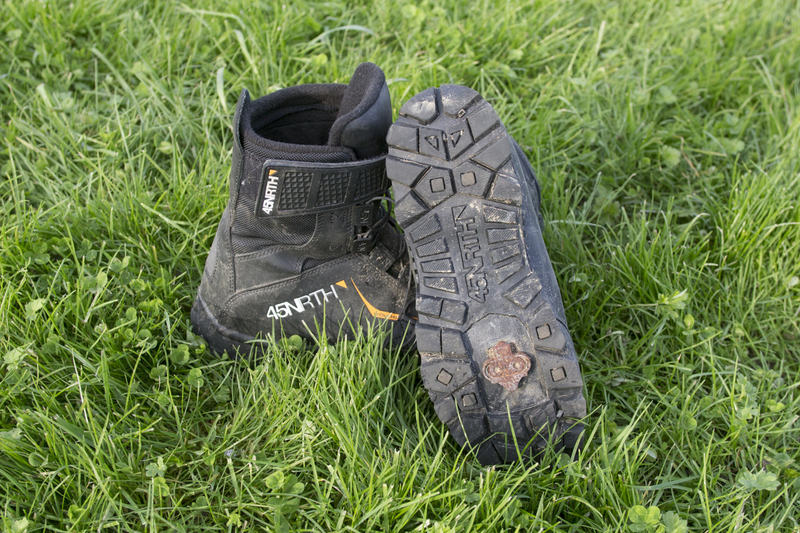 The sole is Mavic’s own brand Contagrip number – in use, it copes well with most surfaces despite the absence of front studs although wet rocks are its nemesis. Pedalling wise, it verges on race shoe stiffness. However, the single dial retention system didn’t work for me as I would have expected it to. No matter how tightly I cinched it down, I still experienced heel rub. It wasn’t a fit issue as I have worn Mavic boots previously without complaint. The sizing was spot on. The location of the dial created unpleasant tightness over the top of my foot but left it loose at the heel. I persevered with them in some appalling conditions but in the end had to give up on them as I grew tired of coming back from rides with blistered heels. Post ride, the boots cleaned up well after a cursory spray down with a hose while I never experienced any water ingress through the soles. Which is nice. The boots are still in very good condition. I used them for a good twenty or thirty winter and spring rides before retiring them for the summer. The sole shows no discernible wear while all the stitching is still in place. Shimano’s classic, walking-shoe style winter boot has been going for at least a decade and is now in its third iteration. Looking very much like a contemporary mid-top walking shoe, the performance matches that look. The upper is Goretex-lined nubuck and the whole thing has a very substantial air to it. Gone, though, is the full Nubuck ‘I’m a 1950s rock climber’ of old, replaced by more techical-looking uppers which initially jar a little, but a few wet rides and everything gains a reassuring covering of silt. The bellows tongue helps keep the boots waterproof in surprisingly deep puddles, though I have yet to work out why the padded backing of the tongue is Velcroed to the Nubuck tongue. Presumably it’s in aid of speedier drying. Though a good overnight on the radiator is about the only thing that will dry them out decently. Good old laces! I’ve found that the laces in the lower four lace eyes tend to take a ‘set’ that’s hard to adjust after a few wet/dry cycles, but being laces the fit is infinitely tuneable, especially from new and you can get the boots set how you like, using the upper hooks and ‘Mini Power Strap’ to fine tune things. The Mini Power Strap is a looped webbing strap that runs on loops with their anchors near the heel, and this is meant to really drive the heel back into the heel cup. 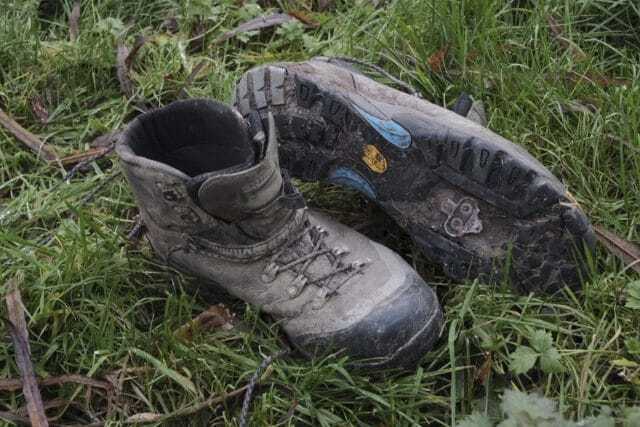 Unfortunately, wet or muddy then dried, laces don’t run that well on equally abused fabric, so the effect is negligible and after a few months of use, the laces start cutting away at the straps, with the straps starting to fray the laces. I’d stick to metal buckles please Shimano. Not sure about the ‘Mini Power Strap’. Saying that, though, the boots are easy to lace and tighten (and I’ve never ever been stuck in them due to the failure of the ‘closure system’) The laces are thin and round, so can self-loosen if not well snugged or double knotted. The Vibram soles are well lugged (they could always be more aggressive, but they’re pretty chunky) and the grip on wet rock is good. You’re unlikely to wear out the tread unless you use them daily for years. 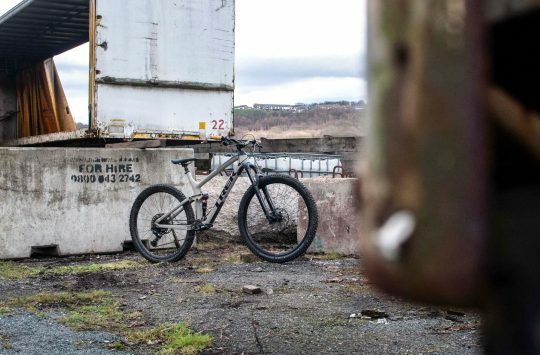 On and off the bike, the XM-9s are substantial, but very positive feeling. Many riders (and bike journalists…) scoff at my affection for these boots, but if you run clipless pedals in the winter, and your riding involves a fair amount of walking, hike-a-bikes and living in your shoes, then having a pair of sturdy boots really helps with grip, fatigue and even injury prevention. Despite probably being one of the heaviest boots out there, it’s a price worth paying, unless you’re super skinny and in a hurry. Not so great for: Lightweight skipping around. Best for: Extended marches over the Lake District fells. 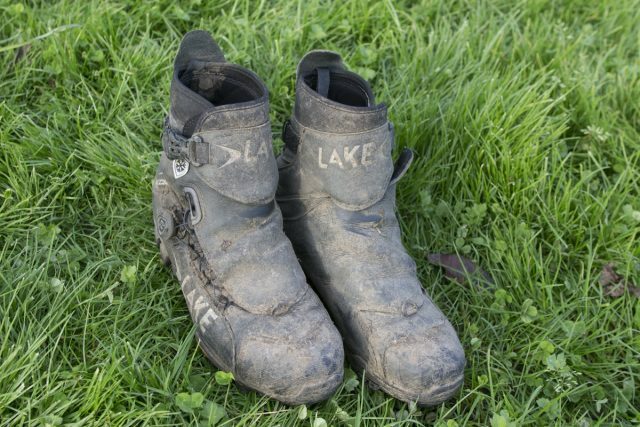 Chunky boots with the credentials to keep you riding and hike-a-biking through a British winter. Enduro orange, even for winter. Specialized has a great range of MTB shoes and having previously been impressed by the 2FO shoes, I was pleased when these arrived as a replacement for my ailing Shimano MT91s. They are a very different boot to the MT91s, having a Boa closure rather than laces, and a Thinsulate and neoprene upper rather than the Gore-tex and leather combination of the Shimanos. The Defrosters have been around for a few years in one format or another, and the more recent editions uses the Boa closure system. The Boa itself sits on the outer part of the foot, in an area where it is designed not to rub and cause any hotspots. This is important because although the Boa pulls the inner lace tight equally along the foot, there will always be more pressure under the Boa closer itself. Specialized has put little extras into the design to help keep the elements out; there is a loop on top of the toe-box to clip your trousers or gaiters and there is a neoprene flap which hooks over the boa to seal the forefoot. The neoprene comes quite high up the ankle with significant velcro overlap to seal everything in. Specialized’s Body Geometry system is incorporated in both the outsole and the comfortable moulded footbed, designed to position your foot in a way that maintain alignment in your joints and help to prevent injury. Because of the Thinsulate insulation, they have so far been warm enough for me to wear just one pair of wool socks with, but there is space for more if the temperature drops. For me the boots are spacious on the forefoot and around the heel but the Boa system keeps them comfortably in place on the bike. Comfort is great when riding with no hotspots or rubbing. I hardly noticed they were there, which is impressive for boots that are quite rigid, especially over the toe-box and in the heel. They are quite stiff-soled, which meant no unwanted pressure on my feet from the pedals and a nice smooth transfer of power to the pedals. Orange soles make you easier to find when you’re headfirst in a snow drift? They are totally waterproof up to the point where you go through something so deep that water leaks in over the top. At that point you can tell how well they do hold water! I cannot tighten the ankle cuff enough that no water comes in, so in an ideal world I would wear these with winter trousers which come over the top of the cuff of the boot. They are grippy to walk in with quite a deep tread, which is very open so it doesn’t clog up with mud. I was confident enough walking on rocks and in mud while wearing them. There is a noticeable difference between the rigidity of the heel box and the softness of the ankle section. This created a creasing of the neoprene at the back of the heel which I noticed digging into my heel after walking in the boots for a while, however I had no comfort issues whatsoever while riding. Compared to my previous winter boots, I found the Shimanos more comfortable for walking in and I find with laces you can be more selective about which parts of the boots you can tighten more. However there are advantages to the Boa system in that you can tighten and slacken them more quickly even when wearing gloves, and you’re not left dealing with loose laces. The Defrosters give me a lot of confidence in their ability to protect my feet and keep water out, and they are warmer than the Shimanos, with room for an extra pair of socks. In my opinion the mens fit is not perfect for my feet but they are excellent boots for rides where I do not have to walk a lot. Note: there is now an updated version of this boot with a more aggressive sole and a fully reflective upper which comes in a little heavier and is more expensive at £185. Not so great for: Walking long distances in. Best for: Extreme mud conditions. 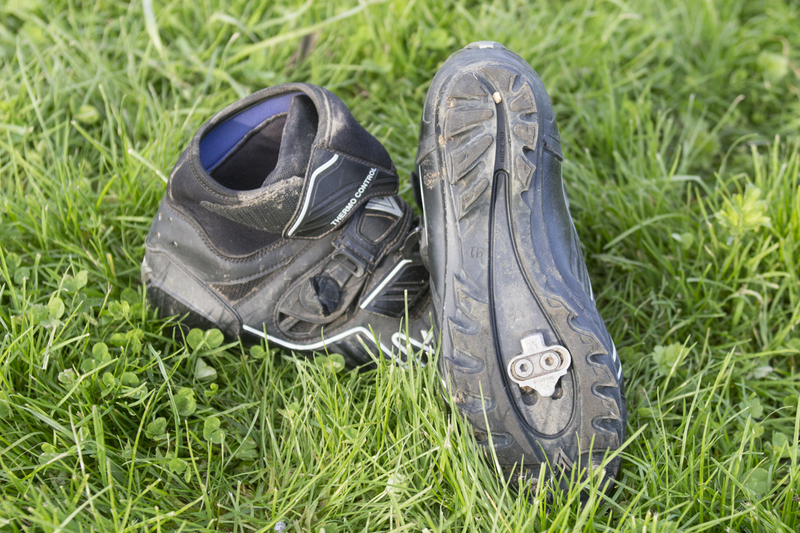 Great winter boots for wider-footed riders who appreciate having warm feet. For not so wintery racing? These are exceptionally comfortable boots, they feel great to pedal in for hours on end, and there’s the right level of stiffness to keep the power transferring through the pedals without your feet starting to ache. As a result, I have worn these boots a lot. In fact, I continued wearing them right through the much of the summer – which perhaps says as much about the winter attributes of these boots as it does UK weather. In the lightest of sprays – think morning mist or melting frost – these boots will shrug off a bit of water, but any prolonged wetness such as puddles on the road or falling rain result in wet feet. The effect of what waterproofing there is seems to be to be akin to boiling a frog – your feet get wet, but it happens gradually rather than an instant shocking soaking. They’re also not especially warm, despite the thermal insulation. They’re warmer than a ventilated shoe, but setting off on a frosty morning you can certainly feel the wind chill on your toes. Take them out in sleet and you’ll be heading back for warmth in no time. These might be great for an Italian winter, but in the UK I’ve found they’re good for everything but winter. In the absence of a pair of lightweight waterproof shoes, I’ve teamed these up with waterproof socks for a bit of added delay to the inevitable wet feet, and worn these for all my spring and autumn riding. 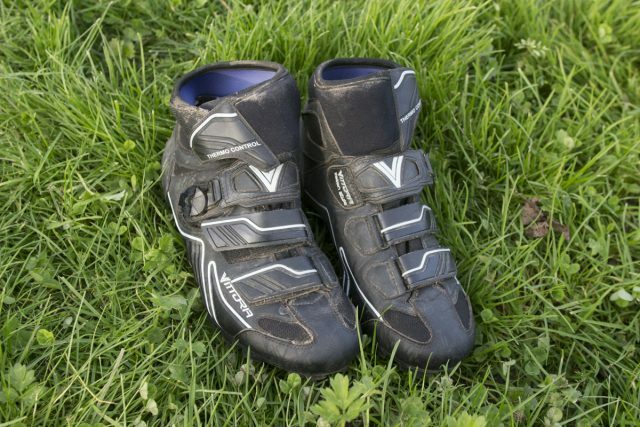 Indeed, I also wore them for plenty of summer riding too, just because I found the fit comfortable on my feet. There’s a reasonable amount of tread on the soles, though it is quite hard and doesn’t feel too confident underfoot on hard surfaces. For those that want the extra grip on soft ground, there are a couple of mud spike points. All in all though, they’re better for pedalling than hiking. 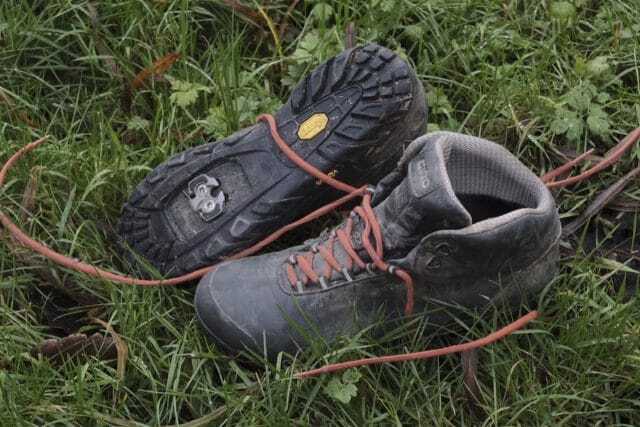 The boots are fastened by two Velcro straps across the arch of the foot, a Boa dial on the lower ankle, and another Velcro strap around the upper ankle on the neoprene cuff. I found that the Boa did most of the work in holding the boot in place, with the upper Velcro section really just holding the neoprene down. I’d have liked more capability to really cinch that neoprene up snug round the ankle, but there’s not enough Velcro available for that. Based on my experience with these boots I’d certainly consider other Vittoria shoes on the basis of comfort, fit and toughness. They’ve been worn an awful lot and are only just starting to show the beginnings of that sagginess that comes with age – and they’ve been soaked through and dried out on radiators more times than I care to remember. 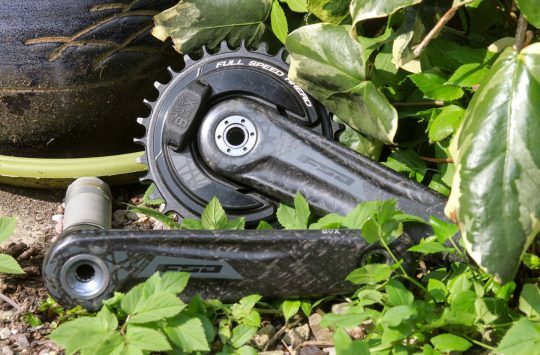 Best for: all purpose spring, autumn and UK summer big pedalling. Not really a winter boot by UK definitions, but worth consideration if you’re looking for something to serve everything except the coldest and hottest days. Prepare yourself for more of this over the coming months. With winter boots though, it all becomes that much more bearable. We promise! Did you mean a centipede’s worth? Well who am I to disageee with the greatness of a very hungry caterpillar! I wear a UK 10/10.5 shoe/trainer and having spent the last few weeks doing online homework, I settled on the Lake MX145 boots (Wide fit, EU46, 290.5-293mm in length). The Mavic Pro SL Thermos came a close second for me, but the fit was rather narrow. I closed my choices down to these two on the basis of wanting BOA/BOA-style closures rather than laces/clasps/Velcro, and something with a grippy sole. Compared to the Lake MX145’s ttwin BOAs, the Mavic’s BOA-style closure was rather haphazard and the additional zips/Velcro just added to the faff. Shame, as I think they look great, and the GoreTex is often a good sign. In the end I discounted any Northwave boots as the not-so-grippy-looking soles didn’t inspire confidence – I have very unstable knees, after many dislocations. Great review but I feel the Scott GTX’s should also of been mentioned. I have used them for three winters now without fault, unlike the Specialized pair they replaced. We didn’t have space and time for all the winter boots out there, Boco. (There are a few other brands missing too) but we’ll be trying to get the missing ones in as and when there’s room. I’ll read this in detail later. I’ve got a really warm pair of North Wave Celsius winter boots, but they’re slippery in the mid sole, which isn’t great. Shimano MW81’s for me from October to April. Thick or thin sealskinz depending on the temp. Light and great for walking.